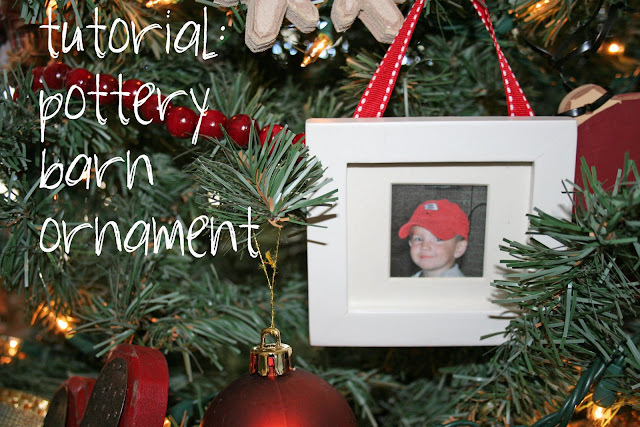 so i'm sure some of you already have the pottery barn ornaments that are silver and are monogrammed...if you are looking to replicate that, look somewhere else cause i don't have an engraver and i'm cheap remember?! 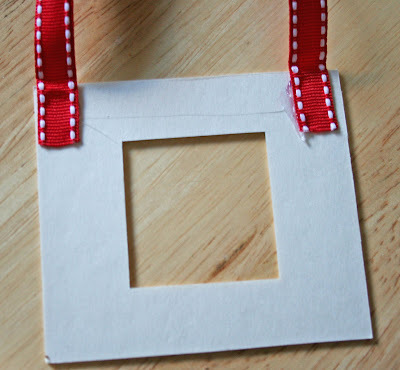 but if you want a cute little knock off of a frame ornament then this is the tutorial for you! 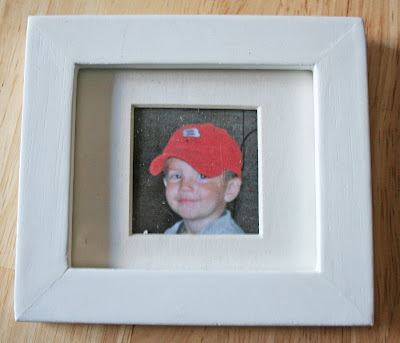 first you'll need a little frame this one measures 4 x 3 1/2 you can go to Micheal's and find small frames or i'm sure you could find them in the frame isle anywhere. next get your glue gun out, don't burn yourself (i usually do) and if you do burn yourself don't swear, cause you're going to have to repent for that one (i usually do). 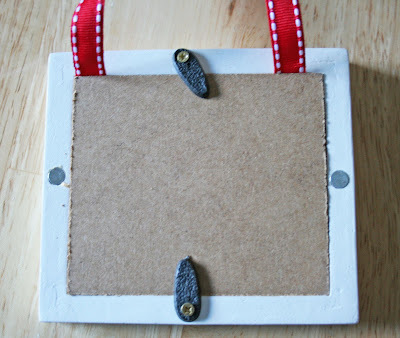 now glue gun your cute ribbon onto the back of the frame or if you are lucky like me and your little frame came with a matte (sp? ), glue gun it to the back of that. voila! presto! finito! that's it ...really...but it sure looks cute on your tree! great idea! This would be great for grandparents. Will have to give this one a try. Love your blog BTW. Great idea! Sure beats the Pottery Barn price too. Guess one could always paint or stencil the child's name across the front as well. By the way, I absolutely LOVE the buffet you redid. It is beautiful! Clever. 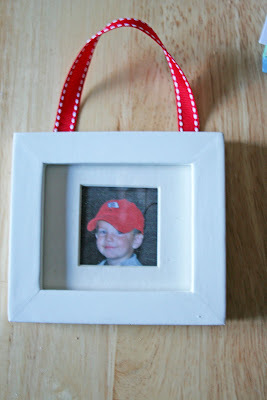 Last year I bought frames at the after Christmas sales and I want to make them for the grandparents every year. I like these frames better so I will now be using your way. Thanks for sharing. Off to Michael's I go! I've been trying to think of something for my 80 year old grandma for her birthday this week... what a perfect quick idea! Just what I was looking for! 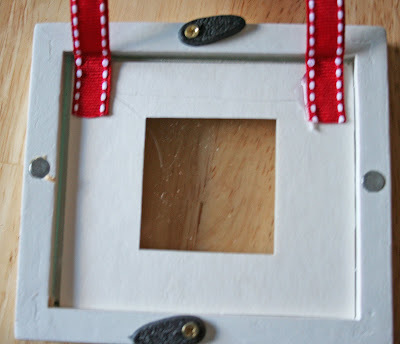 I'm also working on a button tree.. these frames would look cute with buttons glued around the edge too! I am totally going to try that. I wanted a couple of new ornaments on my tree this year. PLUS what a great present for grandmas and grandpas. Hey PS have I mentioned how cool you are yet? Well ya are! i swear you are the craftiest person i know. p.s. i gave your blog an award today on blog. I love it! With the little red hat...darling!! It's amazing how the simplest things look so great! I'm cheap too! Just the thing I need! Thanks for showing us how simple that is, now off to Michaels. Craft! Awesome. Thanks for sharing. So easy - and cute!! Sorry! Didn't realize I was signed in under my daughter's blog Manda. Cool! I like your ribbon! This is do-able, very do-able. I went to your older posts and you really do some neat posts-- the fireplace is awesome--great job!! Enjoy your weekend. And thank you for your sacrifice while your husband is defending our freedom! You both are very cool in my book. Michael's always has such good deals. You have some great ideas there. Thanks for sharing and may you and yours have a wonderful Christmas and New Years. An alphabet set of stamps is all you need to personalize this but it is already cute! Wish I'd found this BEFORE Christmas...but that is what is great about it - saving up ideas for next year and having the whole year to work on them!